This is a rather traditional production (but still taking comic liberties), set in the correct time period with fairly appropriate costumes. The only liberties [with the libretto], I think, were taken in lyric ad-libs and a few spoken lines. The acting is, in my opinion, as good as that in The Mikado, with a few of the same chorus and soloists. The soprano that plays Mabel is quite good. Frederic has a few vocal difficulties (his voice is trained for musicals), but is a good actor and dancer. The photography, sound and picture are unfortunately not nearly as good as The Mikado, but still passable. While this video has some of the theatrical excesses one comes to expect from a Brian MacDonald production, I would recommend it if only for the sheer ebullient theatricality of the performance. A few examples: A Pirate King who considers himself a "Shakespearan actor" but has trouble pronouncing multi-syllablic words; a Frederic who combines a brilliant tenor voice with outstanding ballet training to be the best Frederic I have ever witnessed; an absolutely totally charming Major General Stanley (who certainly shows up George Rose in that Papp thing!). Mr. MacDonald's excesses seem to be of a lesser sort in this production than in the others most of us know. 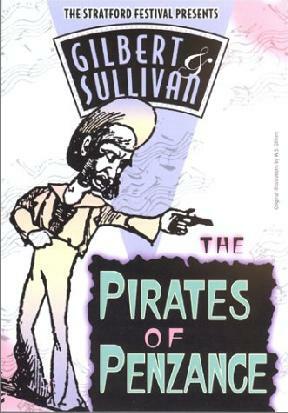 He adds a verse to the opening chorus, adds a chorus to "Climbing Over Rocky Mountains" (largely not understandable anyways), adds a dialogue scene for the Ladies in order to remove additional bits of costuming, adds an encore verse for the Major General and adds a "ballet" chase and fight between the Pirates and the Policemen in the Second Act. He does do the scene changes in the First Act, as I think that Gilbert wrote it and as any production, with money, should do. Pirate ship for the first second ending with the Pirate King Song. In One scene for Ruth and Frederic. Beach scene beginning with the Ladies Chorus. It works, it works. But the most telling moment of the entire performance comes in the Second Act with Mabel and Frederic and "Leave Me Not Alone." For all the fun throughout the production, the deep emotion welling up between the two is quite astonishing and moving. Therefore, I recommend this cassette to all but the stuffiest amongst us. The DVD extras include the texts of both the original and revised lyrics, a glossary, photographs, and program notes. There is also a video tour of Stratford. Mel Moratti obtained a three-DVD package of the Stratford Pirates, Iolanthe, and Mikado, I have seen them sold separately on some websites, such as Amazon.com.